I've actually finished quite a few projects so far this year. Yeah, me! 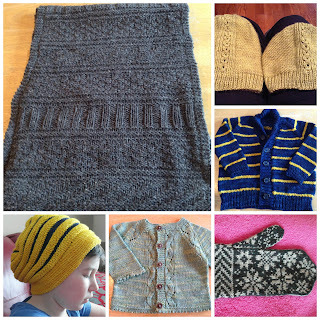 My focus in Q1 has been small projects- they make me feel like a super fast and productive knitter. 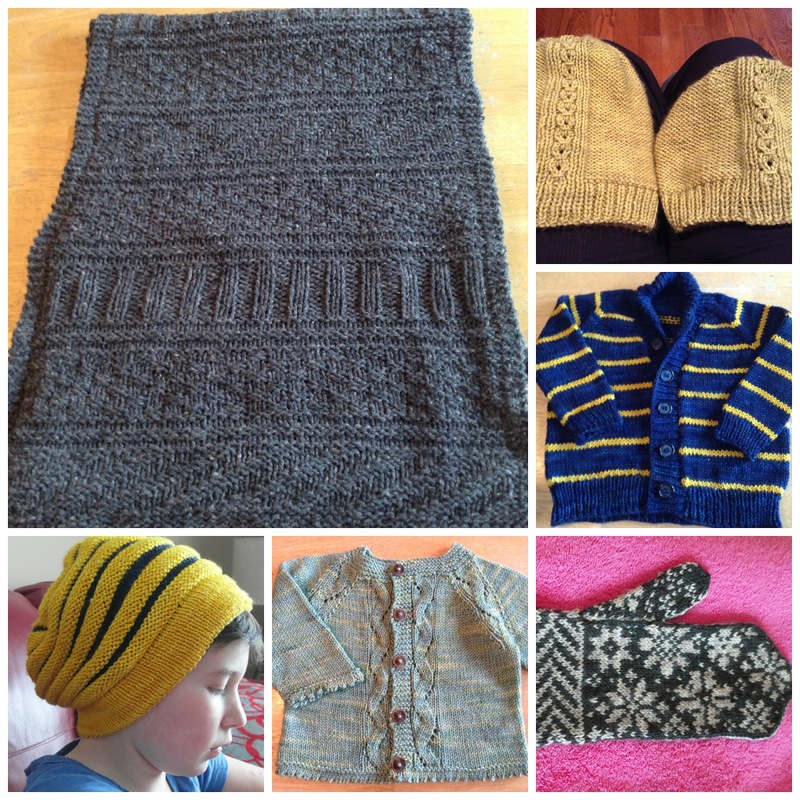 I have finished my Guernsey Wrap, 2 baby sweaters, 3 hats and 1.5 colourwork mittens*. I have several friends or family members who are having babies this year and I wanted to make them something special. I enjoy sending a handmade gift, when I can. 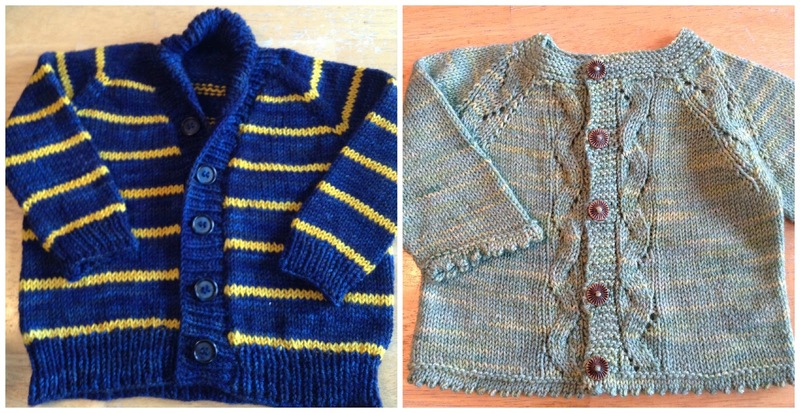 I also don't mind knitting a few baby sweaters to tuck away for a later date. Rather than having to knit under a deadline because in my limited experience that doesn't end well. In addition to the ones above I also started a lovely baby sweater for the new baby of a past co-worker. 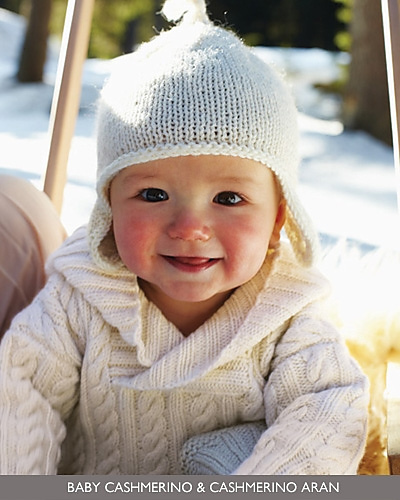 I chose to knit Baby's Hooded Sweater, by Debbie Bliss, from the Fall Winter 2012 Debbie Bliss Magazine. The sweater looked to be an easy enough knit but looked fancy because of the cables. I also thought that a cabled sweater would fit longer than a regular sweater seeing that the cables would give the sweater some significant stretch. I planned to make this sweater without the hood to save time and yardage. In early March I finally got around to selecting yarn and had fussed around a long time trying to pick a fairly gender neutral colour from my stash. I ended up selecting a colourway called Cove, in Madeline Tosh Sport. This is a lovely neutral colour that reminds me of rocky shoreline along a clear water lake. Think shades of brown with hints of blue and green. 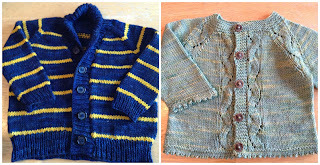 It isn't a classic baby sweater colour but I've always enjoyed non-classic choices, especially for babies. I thought that it would work well for either gender with a cute little pair of jeans. Speaking of deadlines... I thought the baby was due in late March, early April and figured that I was doing well to have cast on by March 8th. Well, of course their beautiful baby girl was born on March 9th. (Of course she was!) I hadn't even finished the cuff of the first sleeve and had lost my cable needle twice so far. Crap. I am the first to admit that I am process knitter but there must be a small amount of product knitter tucked inside me I needed to feel like I was making progress at something! Oh well, back to my infinity knitting. This project is not going to make no progress without me... or, wait a minute, maybe it will. :) It's a process, Knitter! * I'll tell this story soon. ** I have recently given away a large bit of stash (7,658 Yards) of Bernat Satin Solids and Red Heart Soft Touch yarns. 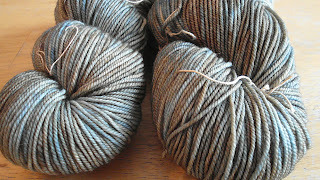 This is deep stash stuff and yarn that I am, clearly, never going to use. I donated all of this yarn to one of the Seniors home in my town. I hope many grandchildren or great-grandchild benefit from this gift.